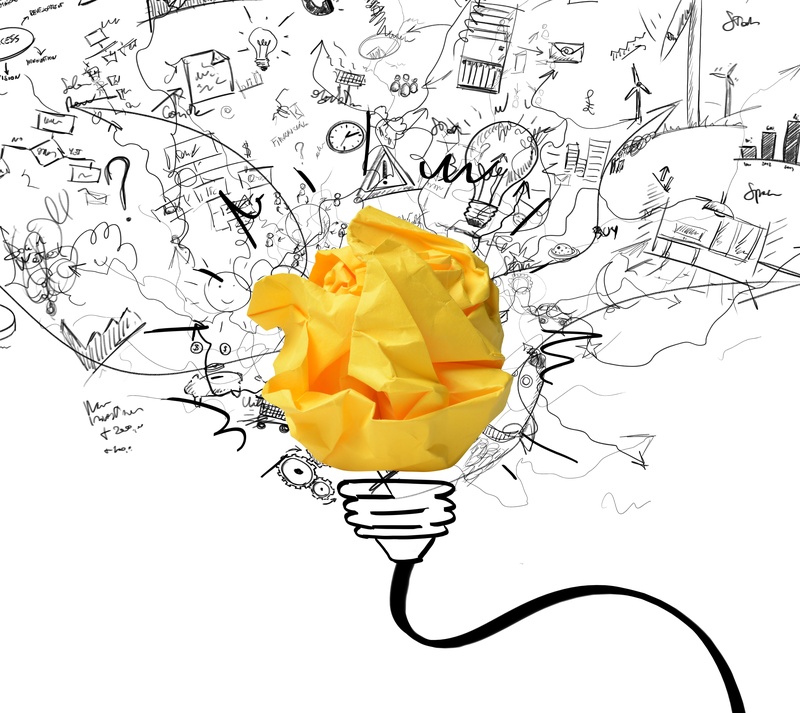 Highly creative ads have double the sales impact of those that are less creative. In March 2017, Michael Wolfe, CEO of Bottom-Line Analytics, sought to compare the effects of media buys against advertising effectiveness on sales revenues. One of the world’s largest Health & Beauty Aids brands joined in and supplied sales revenues. ABX provided creative scores from consumer panels for all brand ads across all media types over a period of 30 months. For more information on this study, and to see several others by Michael Wolfe, go to our resources page. In the chart below, each blue dot is an ad. The media spend per ad is shown on the vertical axis. Sales lift for each ad is shown horizontally. In the ideal world, media spend on an ad-by-ad basis would align perfectly with sales revenue lift, but this is not the case. 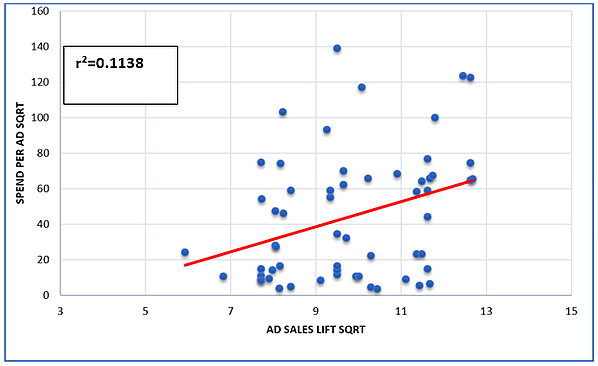 As we see below, the correlation between the ad spend and sales lift was very low at R2=.1138. This graph shows that high media spend does not drive sales. The results show advertising creative drives sales 5x as much as media spend with a correlation of R2=.743! This client could have generated $21 million in incremental revenue by allocating media spend according to creative scores. 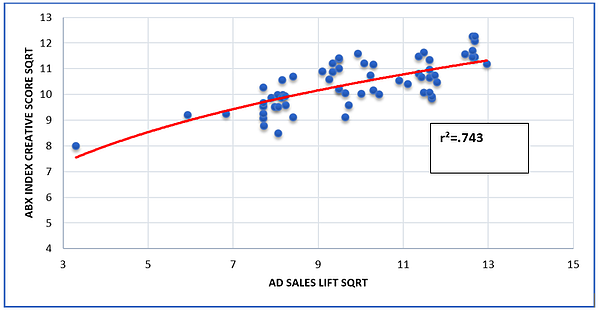 This graph shows that high creative scores correlate to sales lift. While the Reinartz/Saffert and Wolfe studies are different, both focus on the importance of creative in driving success. Reinartz/Saffert shows ads that are creative are twice as effective as those that are not. Wolfe shows that ad creative is 5x as effective as media buys in driving sales. Clearly, a smart marketer will place media buys on ads with the highest creative scores!